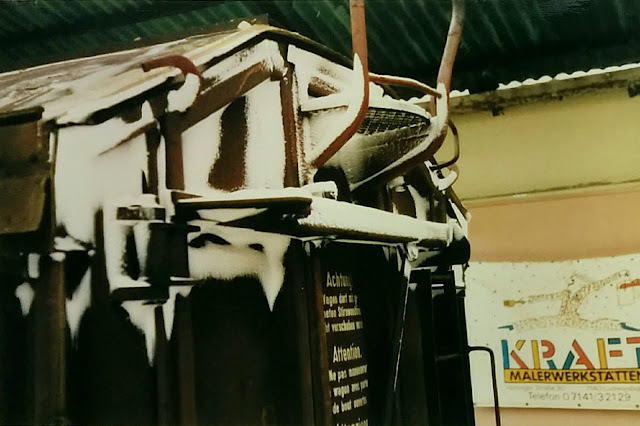 Given the white fluffy stuff outside today, it seems appropriate to post some of the photos I took 30+ years ago. 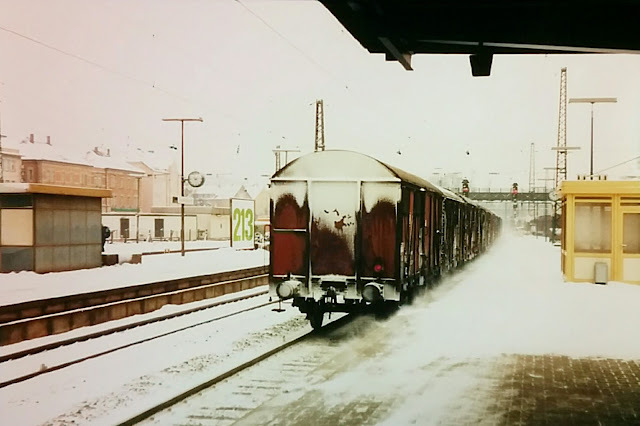 On a rather cold Saturday morning in February 1987 I asked my dad to take me to the station in Ludwigsburg to see what the winter weather was doing to train traffic. It had snowed over night and the white fluffy stuff was all over the place. The photos shown here are scans off color prints. The quality varies a bit. I hope my readers enjoy them nonetheless. 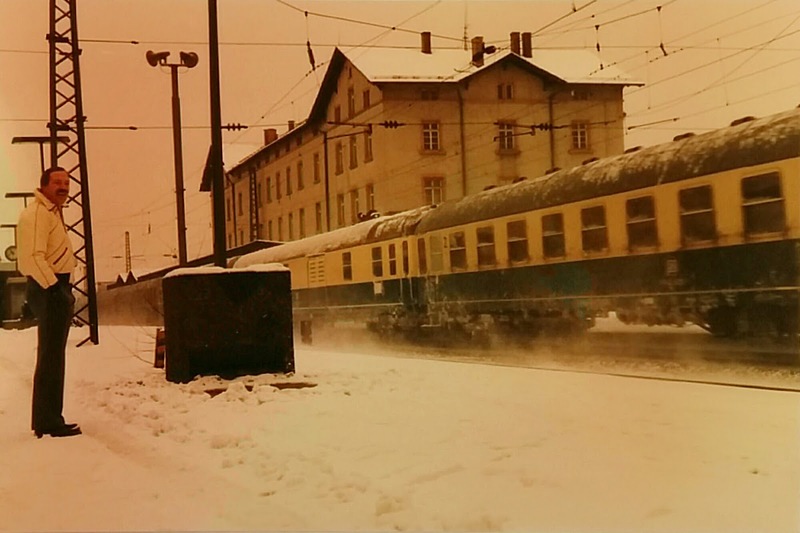 Let's start with snow and ice on a couple cars in what I believe is train 53911 bound for Kornwestheim. I was taking pictures of passenger trains from the platform on track 2, when my favorite locomotive class 151 pulled with train 53911 into track 5 and to my delight slowed to a stop. While 53911 is waiting in track 5, another freight is coming through track 4 at speed. Given it appears to be made up exclusively of box cars I suspect it would have continued to Stuttgart Hgbf, the freight facility next to Stuttgart main station, now replaced by office and apartment towers, malls, and the new city library. Quite a spectacle with lots of noise and swirling snow. The going away shot shows another nice example of snow and ice accumulation on the cars. Speaking of passenger trains ... 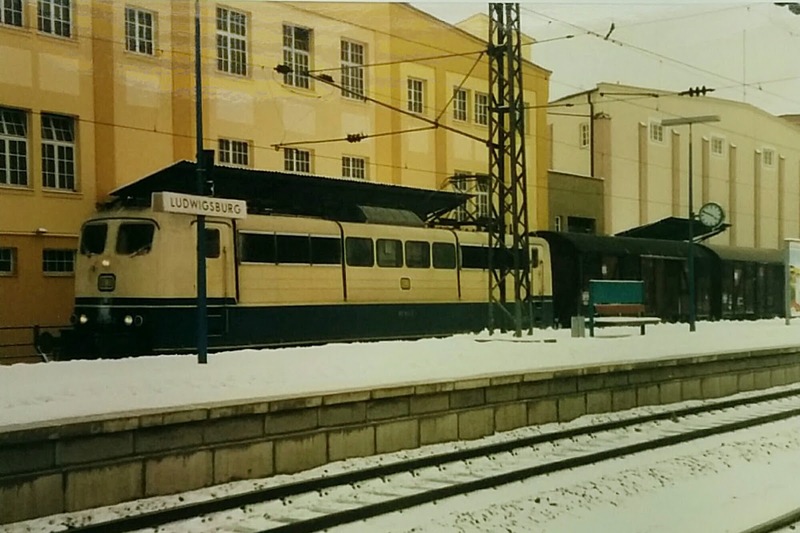 Here's an Eilzug doing its station stop on track 1. 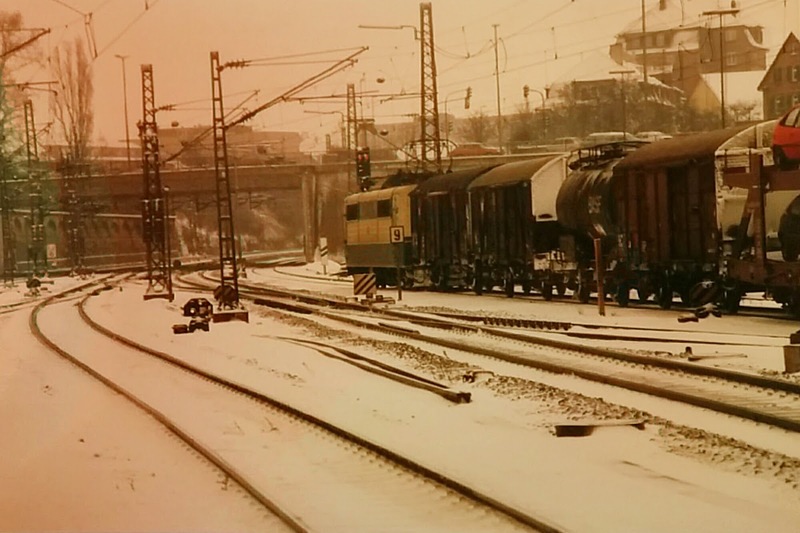 The car at the rear is a MDyg express freight baggage car. 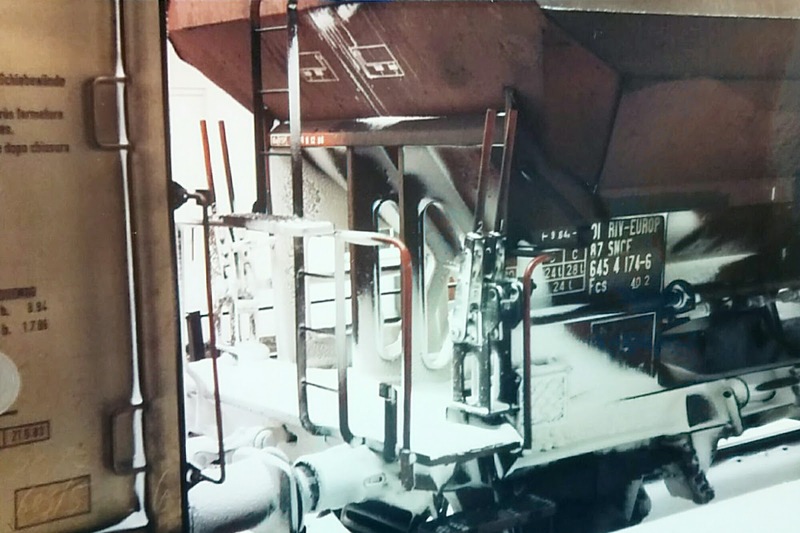 The cart used for loading and unloading express freight is barely visible under the platform roof. This people-intensive service wouldn't last much longer. 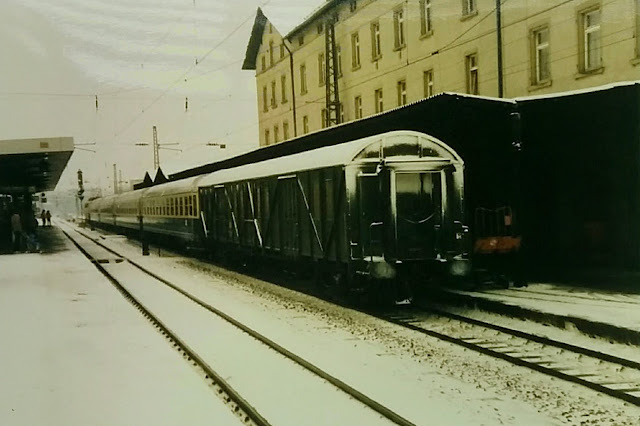 Finally, a passenger through train with a baggage car in the middle of the train. 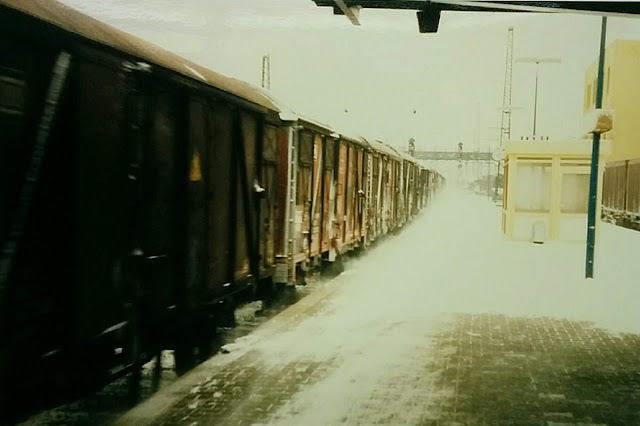 I can't quite make out what kind of cars are ahead of the baggage car. They don't look like German cars. Looks more like a red/grey tone. Maybe Italian or Austrian cars? The old station building is still standing in this photo. Demolition of an annex to make room for the new central bus station had already started, and the main building would start to come down in the fall of this year to be replaced with rather ugly new construction that combines a ticket office with stores and a super market.